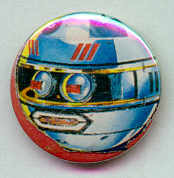 TERRAHAWKS COLLECTABLES, MISC- Pin Button Sgt Major Zero. Unknown origin. Measures just 1 inch (25mm) in diameter, depicting Sergeant Major Zero.